Both the common name and the scientific name say it very clearly: these are not lollipops! As long as you spit out a sample of any of the red brittlegills, taste testing will not result in sickness - but your tongue may tingle for a while if you sample any of the peppery hot ones. 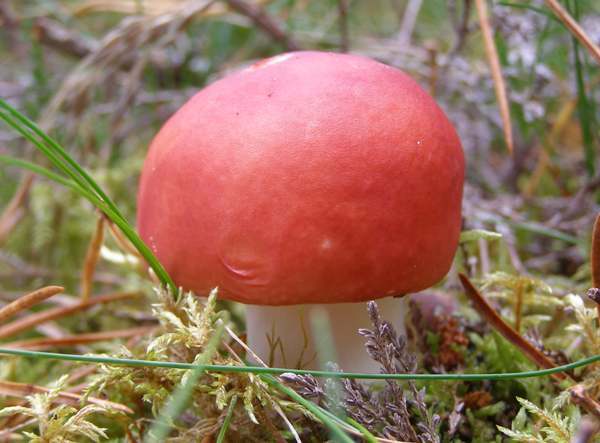 Make a meal of Russula emetica, however, and you can expect to feel very poorly indeed for quite a few days. On the positive side, when in good condition these are among the prettiest of woodland fungi. Very common and widespread in coniferous woodlands throughout Britain, Ireland and mainland Europe as well as in northern Africa and some Asian countries. The Sickener also occurs in many parts of North America. The young Sickener fruitbodies shown above were found in spruce and pine woodland on the Isle of Bute, in Scotland, in September 2012. First described in 1774 by German mycologist Jacob Christian Schaeffer, who named it Agaricus emeticus (most gilled fungi were placed in the Agaricus genus in the early days of fungal taxonomy), this mushroom was later transferred to the genus Russula by Christian Hendrik Persoon in 1796. Synonyms of Russula emetica include Agaricus emeticus Schaeff., Russula emetica var. emetica (Schaeff.) Pers., and Russula emetica var. gregaria Kauffman. Russula emetica is the type species of the Russula genus. 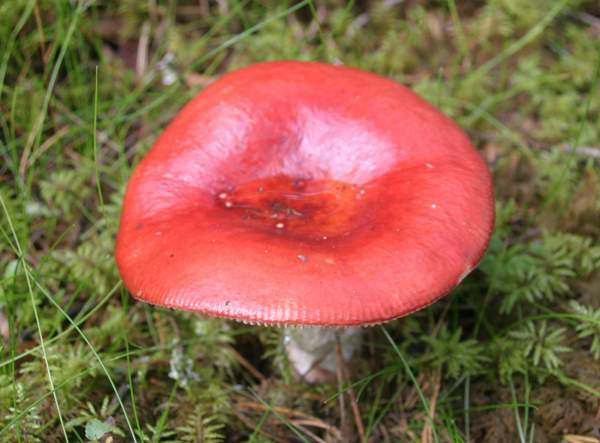 Russula, the generic name, means red or reddish, and indeed many of the brittlegills have red caps (but many more are not, and several of those that are usually red can also occur in a range of other colours!). The specific epithet emetica surely needs no explanation. Russula fungi are colourful and conspicuous, but they are notoriously difficult to identify. Only about 5% of the world's (known!) 750 or so brittlegills can be identified on sight with any degree of confidence. For many species colour is no guide at all, because individual specimens can be red, orange, yellow, white, green, blue, purple (you get my drift) or a combination of several of these colours. So, record every character (feature) that you can. look at specimens at different stages in development, note which kind of tree(s) they are near to, and then check them against a well-respected Russula key for the country/region you found them in. And then resign yourself to the fact that they won't always key out (and that doesn't necessarily mean that you have found a new species!). I'll be you will have more failures than successes...at least until you become a Russula expert, of which there are maybe a dozen or so in the world - and I am lucky enough to have met two of them. Now rejoice: the Sickener is one of the easier ones. 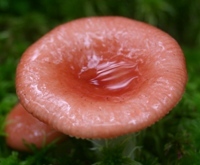 Scarlet, fading in wet weather (the pigment in the cap cuticle is somewhat water soluble); peeling almost to centre; the flesh of Russula emetica is pink beneath the cuticle; cap surface smooth, convex, sometimes becoming slightly depressed when fully mature; margin knobbly with small, rounded bumps irregularly spaced) and slightly striate; 3 to 10cm across. White, turning pale cream; adnexed or free; crowded. 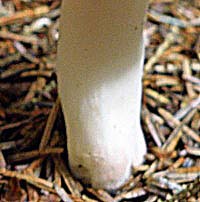 White, sometimes yellowing slightly with age; cylindrical, the base slightly clavate; 4 to 9cm long, 0.7 to 2cm in diameter. Ellipsoidal, 8-11 x 7.5-8.5µm, with conical warts to 1.2µm tall linked by narrow connectives to form a well-developed reticulum. White or very pale cream. Faint fruity odour; very hot and peppery taste. 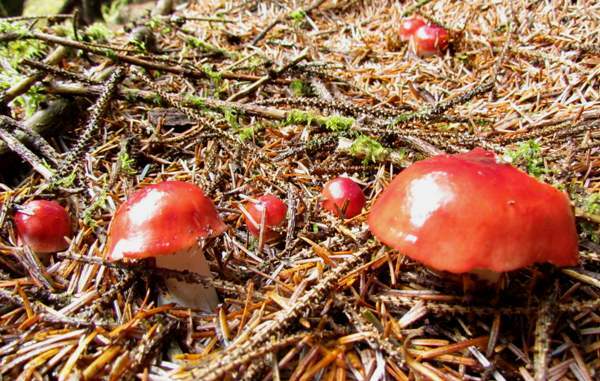 Russula emetica, The Sickener, is found mainly beneath conifers (pines and spruces in particular) and occasionally also on mossy (fairly wet) heathland. 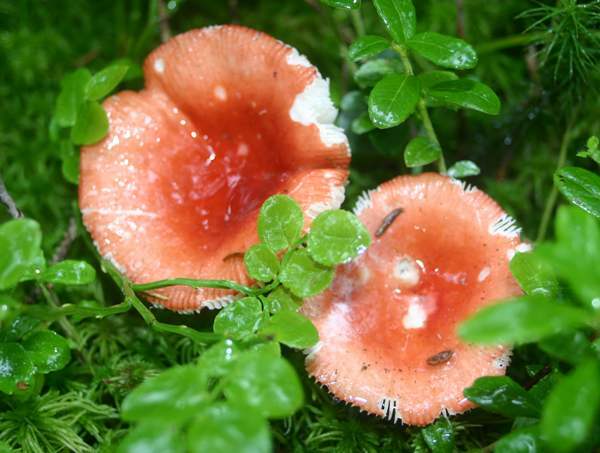 In common with other members of the Russulaceae, Russula emetica is an ectomycorrhizal mushroom. August to October in Britain and Ireland. Another of the ‘red for danger’ brittlegills, this mushroom is very similar in appearance to the Beechwood Sickener, Russula nobilis. Differentiating features are the greater brittleness of Russula nobilis; its convex cap shape even when fully mature; and its cap cuticle, which peels only 1/3 to the centre whereas that of Russula emetica peels at least 2/3 to the centre and often almost completely. Russula nobilis is just as poisonous as Russula emetica and so both should be avoided when gathering mushrooms for food. 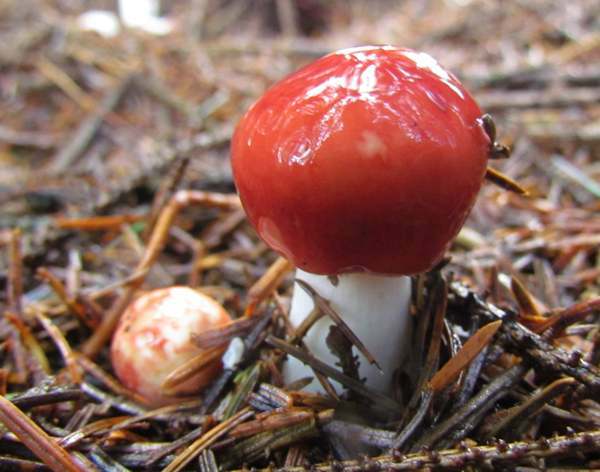 Several other red-capped brittlegills can only be separated from Russula emetica by thoroughly following one of the specialist keys (see below), and in many cases microscopic characters such as spore ornamentation have to be studied using an oil-immersion lens. Geoffrey Kibby (2011).The Genus Russula in Great Britain, published by G Kibby. Roberto Galli (1996). Le Russule. Edinatura, Milan. Paul M. Kirk, Paul F. Cannon, David W. Minter and J. A. Stalpers. (2008). Dictionary of the Fungi; CABI.